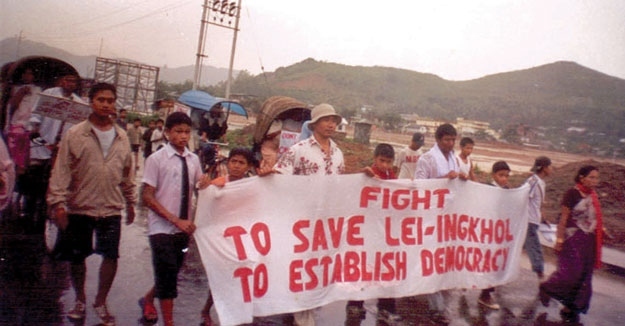 Those were some of the voices when we started protesting the Manipur government’s announcement of April 20, 2005 to acquire our village Lei-Ingkhol, located on a hillside about 5 km from Imphal. The land was to be acquired to redevelop the capital – known as ‘capital project’, but the villagers were never consulted. In more than eight years since, the project has not moved further, but the situation on the ground continues to remain tense. Take a June 2013 morning for example, when villagers woke up to a shock. A team of civil servants along with policemen had come to the village. It was yet another visit of officials in connection with the ‘capital project’– to expand and redevelop the state capital by building new facilities on nearby hilly villages. “We were surprised. It was like a combing operation. No one was allowed to come out of home. Every house and every family head were photographed,” recounts Anil Maimom, president of the village youth club. Eviction once again has been postponed for a while, but that is no solace for villagers. They also wait for a formal announcement of a rehabilitation package, which should have come much earlier. The capital project, one of the several planned under the ‘special plan assistance’ from the central government, is symptomatic of the way this northeast state has been chasing development since 2002, when Okram Ibobi Singh of the Congress became chief minister (he won his third term last year). The building and construction activity provides ample opportunities to politicians, bureaucrats and contractors to extract commission. In the scramble for commissions they indulge in hasty and arbitrary tactics to implement projects at any cost. They resorted to force against Lei-Ingkhol protesters. It has courted controversy after allegations of the lack of transparency and public accountability. The project site was selected hastily, arbitrarily and in violation of prescribed norms. Not surprisingly, blueprints of the project have been altered from time to time at the whim of those who call shots. Activists allege that the project does not have environmental clearance, and that is why it has been split into different components.